Bill Jacobs BMW of Naperville is proud to announce their donation of a one-of-a-kind Children’s BMW M6 Convertible Pedal Car, paired with an ultimate weekend test drive experience in a BMW 750Li ($100,000 MSRP)* for the Big Mac Under Glass Charity Gala on March 8th, 2014. We always enjoy working with the Ronald McDonald House Charities of Chicagoland. They put on fantastic fundraising events, and do a lot of good for the families and kids in our community. 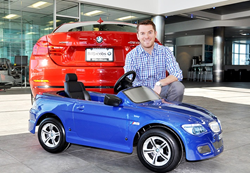 Bill Jacobs BMW of Naperville is proud to announce their donation of a one-of-a-kind Children’s BMW M6 Convertible Pedal Car, paired with an ultimate weekend test drive experience in a BMW 750Li ($100,000 MSRP)* for the Big Mac Under Glass Charity Gala on March 8th, 2014. This exclusive BMW experience from Bill Jacobs BMW is part of the silent auction for the event, and proceeds benefit Ronald McDonald House Charities of Chicagoland & Northwest Indiana. Produced by BMW in 2011, this exclusive M6 Pedal Car comes with a metallic-blue paint job, and sports the original M design. Powered by the easy-go pedal drive, this miniature BMW M6 Convertible delivers sporty driving enjoyment ideal for kids aged 3-7. The adjustable seat and extra-large rubber tires outfitted with M6 rims give this child’s dream car a true go-kart feel. Additionally, it is the only one of its kind in the United States, and thus, a very rare collector’s item. For the adults, the ultimate weekend test drive in the new BMW 750Li also included in this package can be a great Father’s Day gift, or the perfect getaway car for a weekend with the girls. It combines charisma with superior performance and is powered by a 4.4-liter BMW TwinPower Turbo V-8, 32-valve 445-hp engine. This Ultimate Driving Machine offers gracious legroom and top-notch technology, making the new BMW 750Li an unforgettable experience for driver and passenger alike. The Big Mac Under Glass Charity Gala is the organization’s largest annual fundraiser, attended by nearly 1,000 high profile guests. Attendees can expect a lavish evening at the Sheraton Chicago Hotel & Towers, 301 East North Water Street Chicago, IL 60611. This year’s theme is “A Night in the Emerald City.” Dress code is black tie optional, with emerald accents applauded. The event will kick off at 6:00 pm with a cocktail reception and silent auction, followed by an exquisite dinner and musical entertainment at 7:30 pm. The music, dancing, and raffles will continue into the night. To register for the event, visit http://www.Ronaldhousechicago.org/bigmacunderglass. Guests will have an opportunity to bid on the BMW Experience package at the event, but also have the chance to get a head start on the bidding now. The silent auction items are already available for early bidding online at https://myab.co/events/ep/i/silent/. To view packages and place bids, participants can simply register with their cell phone number to gain immediate access to the auction. Bill Jacobs BMW has been actively involved with the Ronald McDonald House Charities for many years, and takes pride in giving back to the organization at every opportunity. The dealership has been a regular participant in past charitable events for RMDH, hosting a holiday toy drive for the kids staying at Ronald McDonald House Hospitals this past year. Bill Jacobs BMW has also been a major sponsor in the annual Ronald McDonald House Charity Golf Classic. “We always enjoy working with the Ronald McDonald House Charities of Chicagoland. They put on fantastic fundraising events, and do a lot of good for the families and kids in our community,” said Greg Joutras, General Manager at Bill Jacobs BMW. “The M6 Pedal Car is the only one of its kind in the U.S, and just having it out on our showroom floor for an hour had all our customers gravitating towards it with smiles,” continued Joutras. Ronald McDonald House Charities keep the families of hospitalized children together in a home away from home. Caring for families of children with complex medical needs by providing comfort, compassion and community, their four Chicagoland houses allow families to eat, sleep and find the emotional support they need – just blocks from where their child is being treated. *Arrangements for the BMW 750 LI weekend test drive (Friday pickup with Monday return) must be made in advance through Bill Jacobs BMW in Naperville. The driver must be over 24 years old, with valid driver’s license. Some restrictions apply, including mileage.